So our last day had come round so quickly! 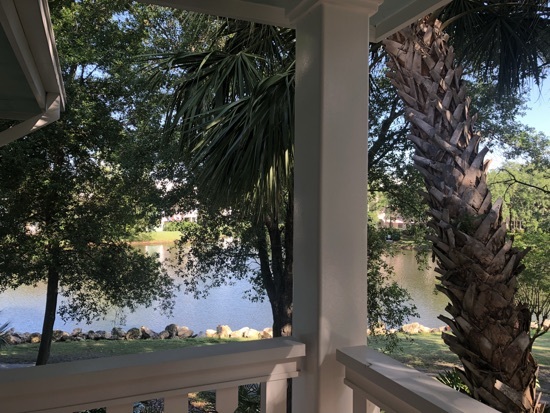 None of us were ready to go home  We packed up our belongings relatively easily and had a quick pop tart breakfast before saying goodbye to Old Key west and heading to Epcot for a couple of hours. picked up a fast pass for test track at 11.40am for Dd and DH to use. When we arrived we noticed how much busier it seemed today than the past few days, it was 10.45am and we had a while before our fastpass time. We first went to the playground over by the showcase plaza so Dd could have a play. 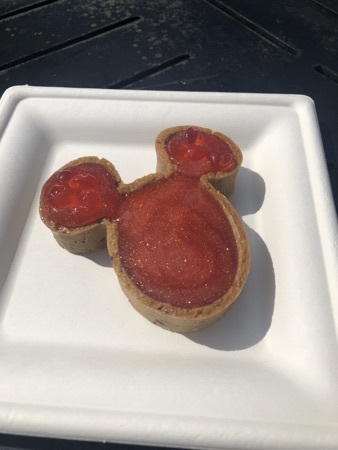 We then Stopped at the flower and garden food booth next door and got the peanut butter and strawberry tart. This cost $4.50 and was really tasty! It had strawberry boba balls in the ears too. I can see why people like pb&j! After we ate this we called into club cool and then had a look in mouse gears. 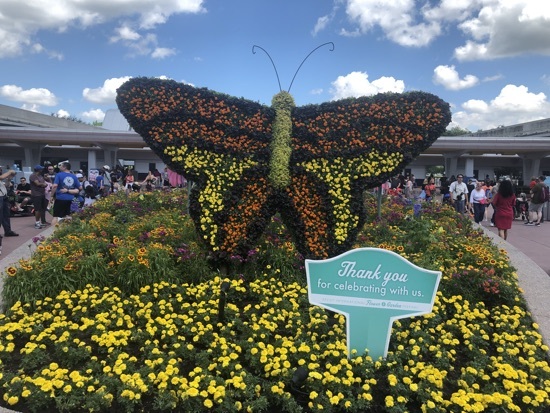 On the way we spotted the queue for the 2nd flower and garden passholder magnet which was released today, this one had daisy on and is probably my favourite one yet! It was now time for DH and Dd to go on test track, I sat and waited outside for them, taking in the last bit of Florida sun. I also worked on getting them a spaceship earth fastpass for before we had to leave as the wait time was showing at 35 minutes. It only took a few minutes but I picked one up for 12.05pm. When they are off that track they were very proud of themselves for designing the most powerful car of the day so far with a score of 102. 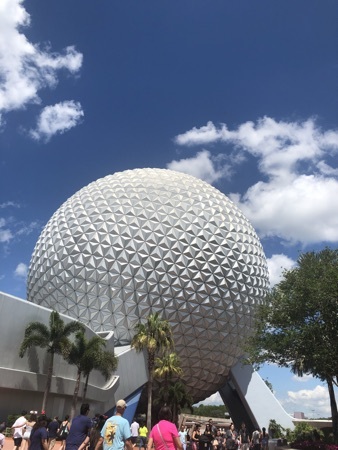 We walked over to spaceship earth and Dd and DH rode this while I had a walk round the entrance area and took a few photos. It was a gorgeous day today with a high of 31 degrees. 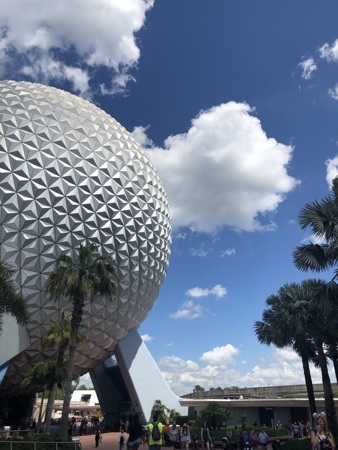 t was now time to make our way to the airport, we left Epcot at 1pm and stopped off at the speedway gas station by Disney springs to fill the car for it&rsquo;s return, only cost $32 and that was all the fuel we put in the car all holiday! Bargain! We got to the airport and check in was almost empty! We&rsquo;ve never seen anything like that before, it was all very calm and easy. We walked into the main terminal area and decided to go to Chilis for some lunch. DH ordered a lemonade, I had strawberry lemonade and DH had a Coke Zero. 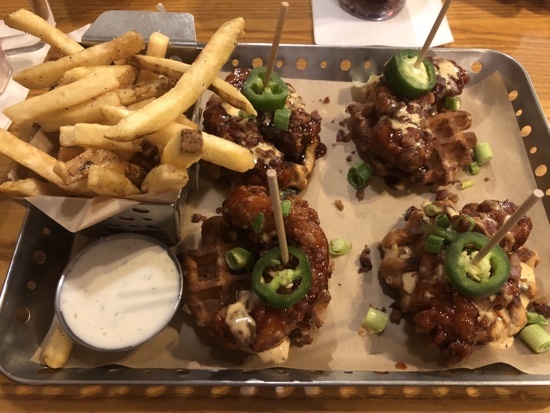 For our meals I had the honey chipotle crispy chicken on waffles, these were really good! I only managed 2 and a half of them, the portion was huge! 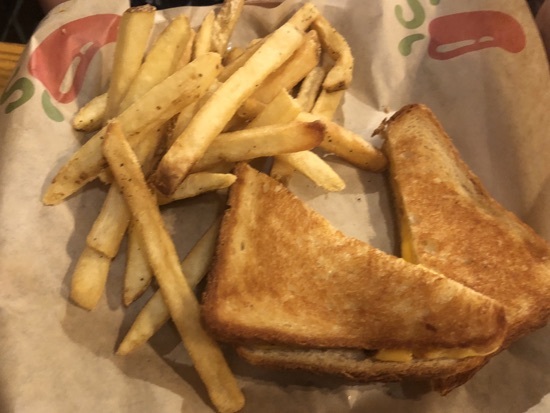 Dd had the grilled cheese kids meals which came with fries, she really enjoyed this. 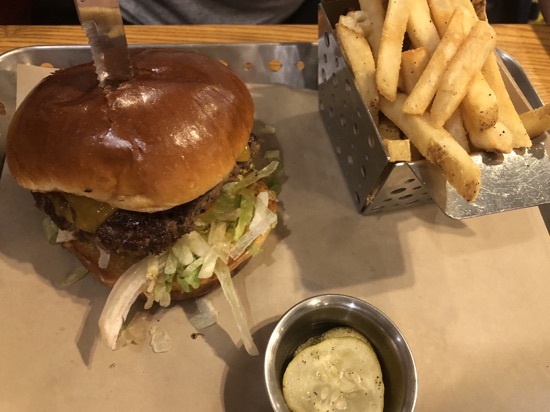 DH had the old timer burger, he said this was really good! 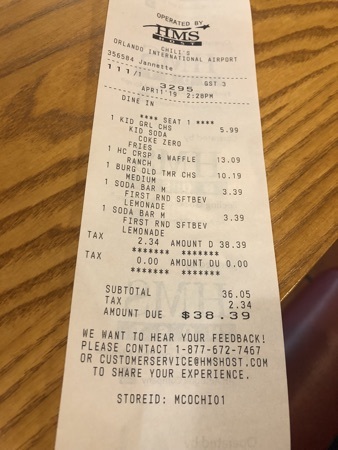 Total came to $38.39, we&rsquo;re always impressed by the food and price of eating here in the airport. We then joined the queue for security just after 3, this took ages! The wait time was showing as about 40 minutes, it took longer than that and we finally made it to the gate about 4.25pm! We were starting to stress a little as it was taking so long and we were concerned about missing our flight but it was fine, we boarded later than expected and took off about 10 minutes late. The delightful person say infront of me reclined immediately. They even had a spare seat next to them so plenty of room and comfort for them. First we were given a drink and a small bag of pretzels. The menus for dinner were handed out and he choices were Malvani chicken, pulled pork and mash or gnocchi. I chose the pulled pork and it was disgusting, one mouthful was more than I could stand. 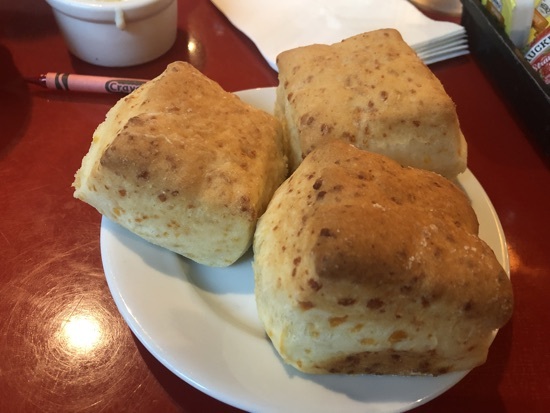 It came with a bread bun, cheddar cheese, and a cake love pot. The cake was salty caramel and tasted pretty good. Dd had a kids meal which was cheesy pasta, this wasn&rsquo;t great either. 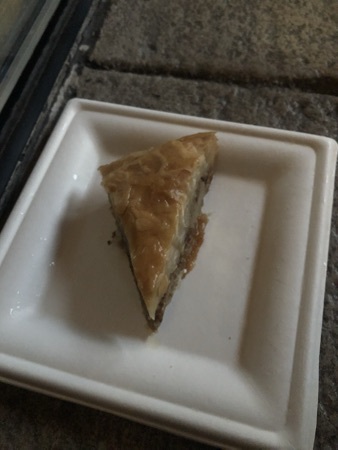 The food was so unappetising I didn&rsquo;t even bother getting a photo of most of it. I watched escape room the film which was ok then settled down for a nap, the person behind repeatedly banged by chair playing one of the games on the screen, so sleep was pretty interrupted. I did manage to get some and was awoken as they came round with breakfast. This was a blueberry yoghurt, some kind of cheese and ham pastry thing and a oat bar. I had a glass of orange juice and left the food. 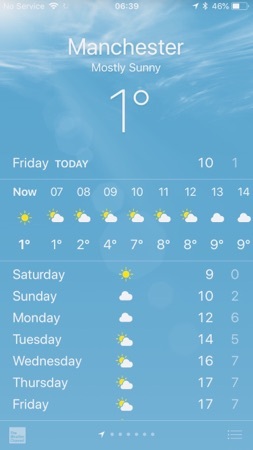 We landed 15 minutes late at 6.20am, it was 1 degree in Manchester significantly colder than Orlando! 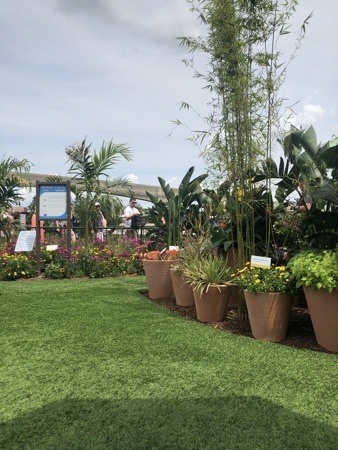 We were through passport control very quickly and had a bit of a wait for our cases, once retrieved we rang vip and were directed to the west parking garage which was a couple of minutes walk from the terminal. Once inside it wasn&rsquo;t long to wait for our car to arrived and we got sorted and set off on the 2 and a half hour drive home. Unfortunately about 20 minutes in Dd was sick and we had to pull off the M6 into a car park outside Warrington to sort her out. Dd fell asleep after this and we were home before 10am. Can&rsquo;t believe the holiday is over! It&rsquo;s gone so fast! 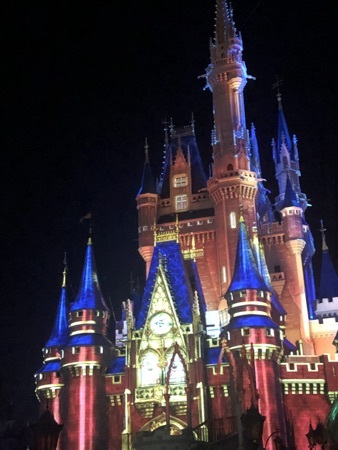 That&rsquo;s it for our Disney fix in 2019 and our last as a family of 3! So next door started kicking off at 5.40am this morning. Same noises as yesterday and general shouting and carrying on. I tried to ignore and get back to sleep but it didn&rsquo;t happen. They finally went out at 7am and peace ensued. I got back to sleep then and woke again at 10.30am. This mornings plan was a visit to the pool, so we got ourselves ready and drive round to the main pool. Dd had a play in the playground again and I got myself some loaded nachos as a snack to put me on till later. Hear were homemade crisps topped with pulled pork, cheese sauce, sour cream and salsa. They were pretty good and put me on nicely. These were $7.99 so not badly priced. 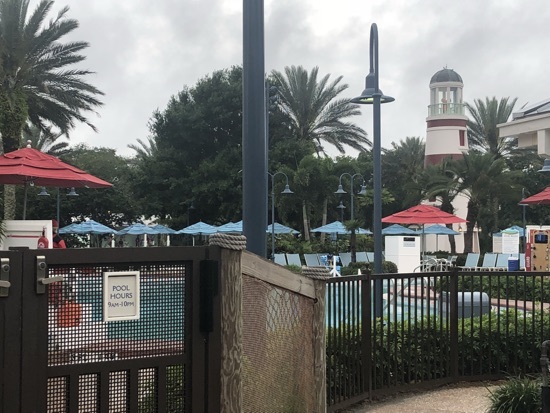 We spent an hour or so in the pool and then made our way back to our room to get changed and ready to head to magic kingdom for the rest of the day. We arrived at the transportation and ticket centre and decided to get the monorail. We were sat on it for about 29 minutes before it moved anywhere, it was first &lsquo;holding for further traffic clearance&rsquo; then it was undergoing a maintenance check. We finally got to magic kingdom about 2.40pm and noticed the Easter bunnies doing a meet and greet next to city hall. There was literally no queue at all which I was surprised at and actually thought we would be turned away and told they were leaving but no we were quickly meeting the bunnies. After this we walked round to Frontierland crossing before the parade started and got the raft to Tom Sawyer island. Unfortunately due to our delay with the monorail we missed aunt pollys being open. We spent some time exploring the island and Dd loved the caves and fort. We crossed back over to Frontierland a were all feeling hungry so first stop was the market square in liberty square. DH got a hot dog and Dd got an apple, this came to $10 and DH had inhaled the hotdog before I&rsquo;d even realised. 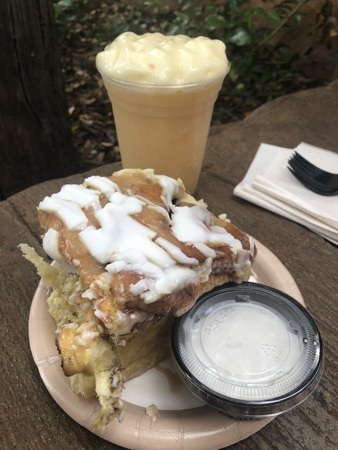 We kept on walking towards fantasyland and upto Gaston&rsquo;s tavern, we got a warm cinnamon roll, with extra icing and a le few&rsquo;s brew. 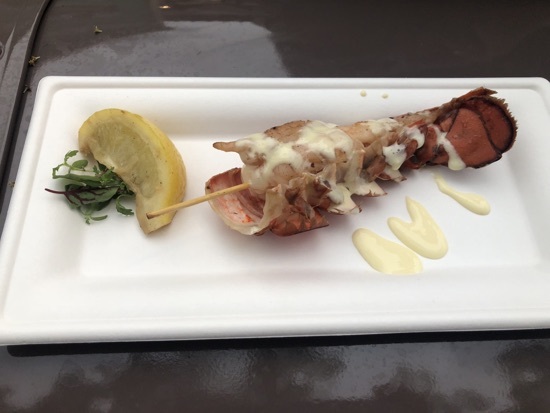 This came to $11 and was absolutely delicious, it&rsquo;s big enough to share but I&rsquo;m sure I could take on one of these on my own! We continued our journey around magic kingdom and came to Tomorrowland where DH was wanting to go on the carousel of progress, DH and Dd went and watched this while i did some people watching. 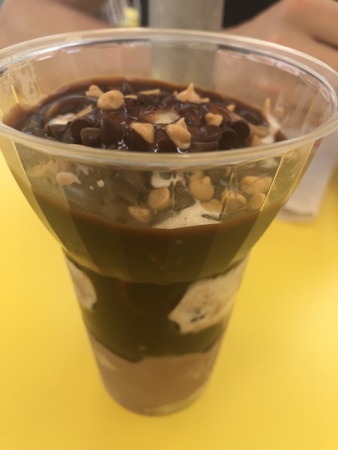 If we hadn&rsquo;t already had enough sugar we thought a visit to the plaza ice cream store was a good call right about now, we got 2 sundaes to share. First up was an all American sundae, this was with chocolate ice cream and cookies and cream ice cream. I&rsquo;m not a fan of whipped cream and they put too much on so I asked for it without so this is just topped with the hot fudge and peanut butter sauces and chocolate and peanut butter chips. I still got the cherry as Dd loves them. 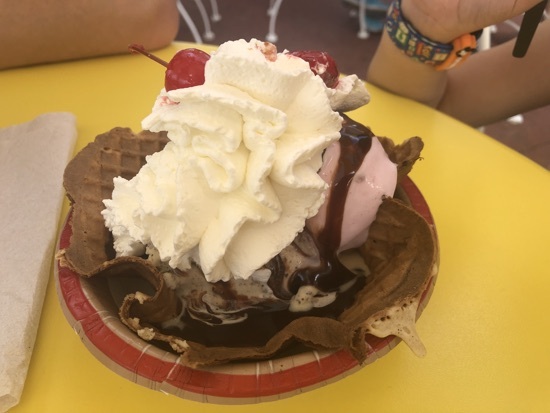 Our other sundae was a plaza sundae, cookies and cream ice cream and strawberry ice cream in a waffle bowl with fudge sauce, whipped cream and a cherry. These came to just under $15 but was more than enough between 3 of us and totally delicious. 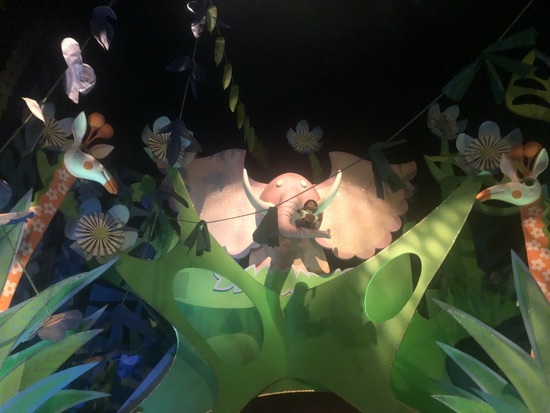 We had our now relatively calm ride on the carousel and walked down to storybook circus where we went to meet daisy and Pluto in the circus tent. The characters were great and the queue was only about 10 minutes. 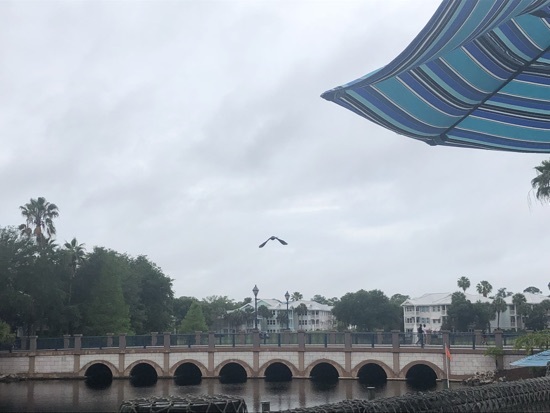 We had been hoping to see the falcon heavy launch on live feed/in the sky but discovered it had been delayed again so we mobiles ordered ourselves a snack from cosmic rays and went and had a sit down for 20 minutes. We got a kids chicken nugget meal to share and picked fries for both sides. We got a small tray of tomato slices and pickles and shared his between us. It was a nice little snack and enough to keep us going the rest of the evening. Great value at $7.69 with a chocolate milk too. DH had been walking to catch the philharmagic again so this is where we ended up next, excellent timing as we only had a few minutes wait when we got there for the next show. This is absolutely brilliant and it was great having people in the row behind us who had never seen it before they were massively impressed and loving it. After a slow walk round by Tomorrowland we decided we would look for a place to watch happily ever after, we got to the front of the castle about 30 minutes before it started and there was still quite a bit of room. We decided as we had never watched it from close up we would wait and watch it from here tonight. 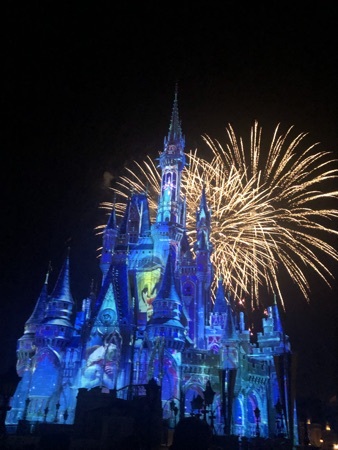 It was so good watching it close and being able to see the detail of all the projections on the castle. 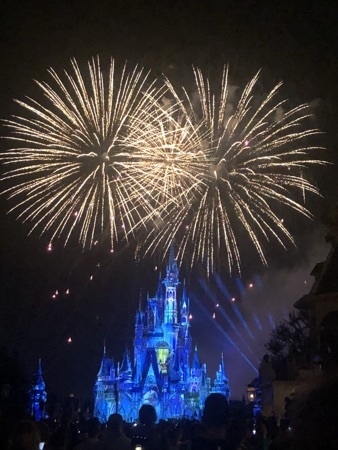 The fireworks are more difficult to see as some as obscured by the castle itself from this close up angle but we really really enjoyed it and maybe I future will watch it from both positions. 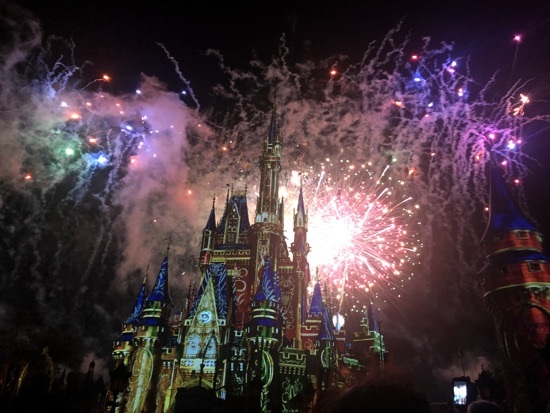 After the fireworks there were still 25 minutes or so left of park opening then it was extra magic hours. 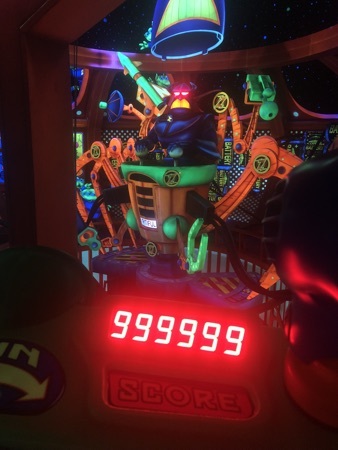 As Dd and I still had a multiple experience fastpass we decided to ride buzz light year space ranger spin together while DH sat in Tomorrowland and took in the surroundings. We weren&rsquo;t as successful this time with our scores but enjoyed the ride all the same. When we came off we walked up to the teacups and rode these, these were a walk on and Dd really enjoys seeing how fast she can spin us. Next we had planned to the the people mover but they close it during extra magic hours. Instead we saw the Astro orbiters had a really small queue so we went on these instead, the view from up here at night is amazing! And the ride itself is pretty fast and throws you around when landing again, but we loved it! From here we took a slow walk round to the haunted mansion, again another total walk on, we enjoyed the opportunity to look on the queue at the different gravestones and interactive bits. We got off here and walked on over to pirates where again there was no queue, there were only a couple of people in each boat going round which was great. This part of the park seemed particularly deserted. By now we had about half an hour left and I saw that big thunder mountain had a 5 minute wait so thought this would be a good ride for Dd to finished our visit to magic kingdom with. DH and Dd rode this while I sat on a bench by the exit and other than a couple of other people waiting for riders and the people coming off the ride every couple of minutes this area was so quiet! It didn&rsquo;t take DH and Dd long so I suggested they went again, which Dd was thrilled about! 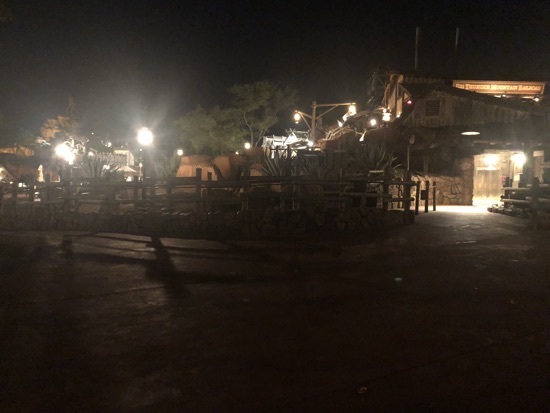 After their final ride we made our way back through Frontierland and onto main street, we stopped for a picture on Main Street which was emptying out now and then headed on down to the resort monorail for our ride back to the car park. 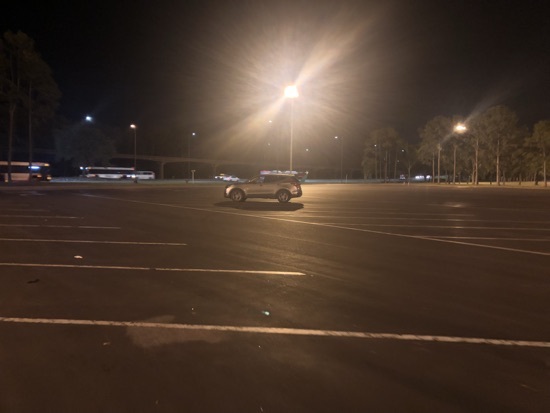 The car park was pretty deserted when we got there and we had no problem locating our car, it was a tired drive back to Old Key West and we were in bed just before 1am. We all woke up at a decent time this morning. Got ourselves ready and headed out to animal kingdom. 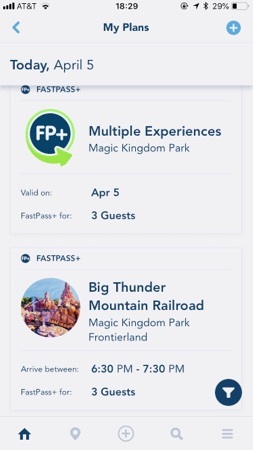 Originally our fast passes were made for animal kingdom this evening but within 5 minutes of #poundingtheapp I had modified them at got DH and DD flight of passage at 10.30, Navi rover journey for me at 10.50am. 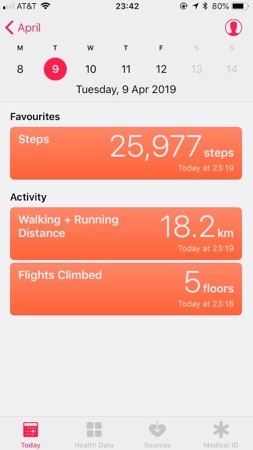 Then Kilimanjaro safari at 11.55am and Everest at 1.30pm. We parked up and got the tram into the park, bag check was empty which was a nice surprise. We walked over to pandora to use our fastpasses as it was now 11am. I rode Navi then called at pongo pongo to get a night blossom drink. This is soooooo delicious and cost just over $6 including tax. 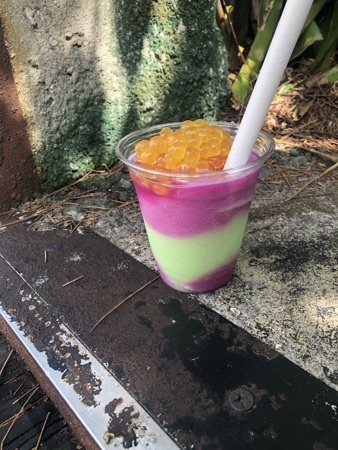 The boba balls are passion fruit flavour and I love that they fit up the straw! I finished this just before DH and Dd came off of flight of passage, again Dd really enjoyed this. We walked round to the safari which it was now time for, DH and Dd rode this and I waited for them on a bench at the exit of the queue, when they came off Dd was disappointed she didn&rsquo;t get to see any pigs (warthogs? ), but they did see loads of rhino and giraffes and the lion was out. It was not lunch time and we had decided we&rsquo;d eat at yak and yeti today. We arrived at the counter and asked for a table showing our Landry card and were seated in less than 2 minutes which was great. I knew right away what I was having. 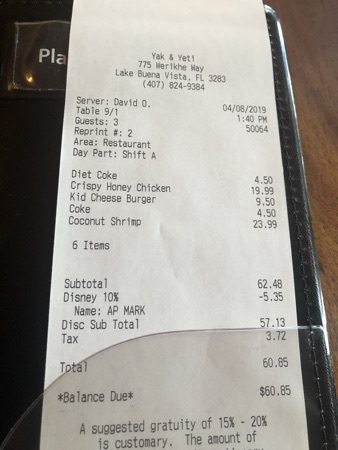 We ordered our drinks, coke for DH and I, apple juice for Dd. 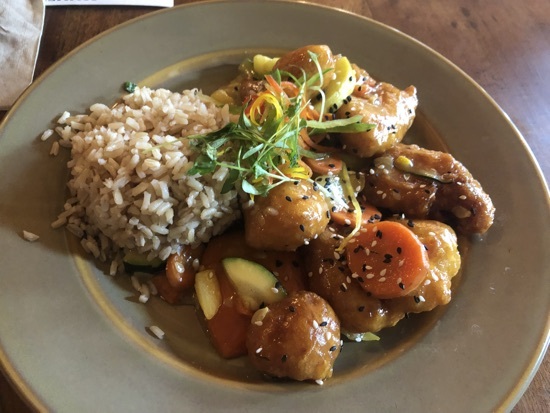 For our meals I had the crispy honey chicken. This was served with brown rice and was really good, I ate every single piece. 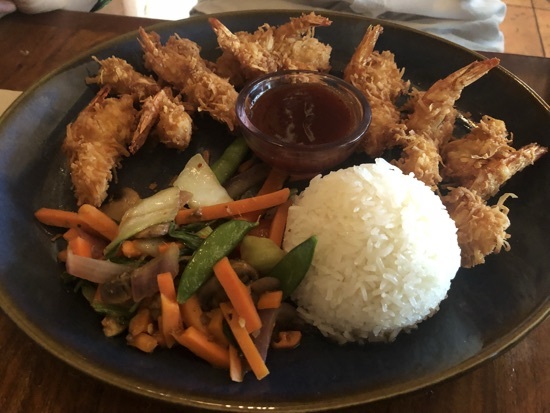 DH had the coconut shrimp and again thought this was really good. 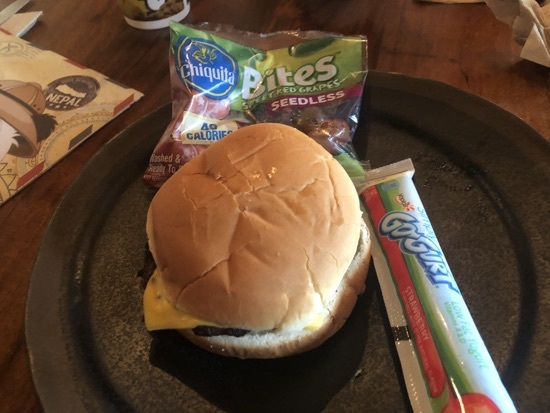 Dd had the kids cheeseburger meal. She chose the grapes and yoghurt for sides. She ate almost all of this, I finished he last bite or so of burger and it tasted really good! Total came to just over $60 including our 10% passholder discount. After lunch Dd and DH went on Everest and I picked up a fastpass for them to do kali rover rapids a little later. 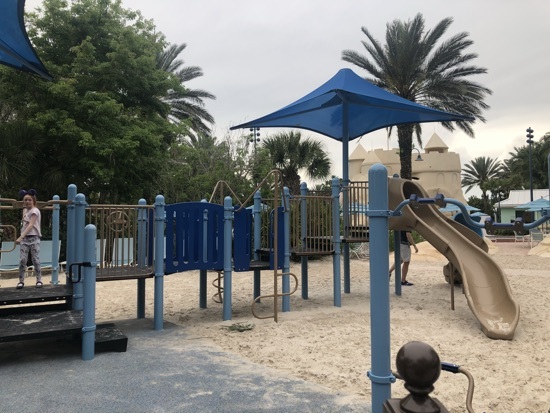 After Everest Dd was wanting to hit the boneyard play area so we spent half an hour in there playing on the slides and digging in the sandy area for fossils. 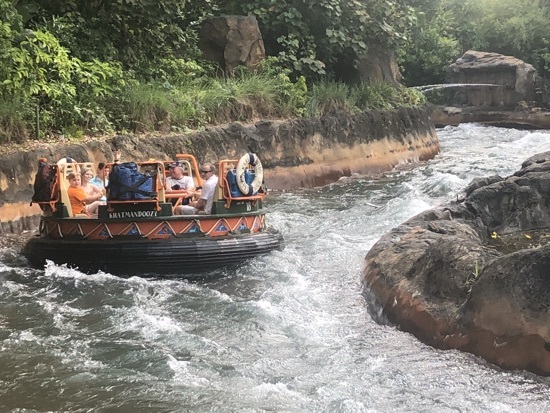 The weather today had been better than anticipated so the ride on kali rover rapids was welcomed by Dd and DH to cool them selves off. While they were getting soaked I grabbed a fastpass for the Minnie and Mickey meet and greet, so when they came off the ride that&rsquo;s where we headed. This was one of the best character meets we&rsquo;ve had in a while. 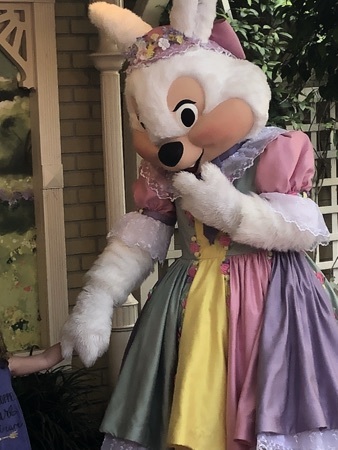 Both Minnie and Mickey were interacting with all of us saying they liked DD&rsquo;s dress and my Epcot ears and Minnie was flirting with DH which was hilarious and Mickey kept stropping. 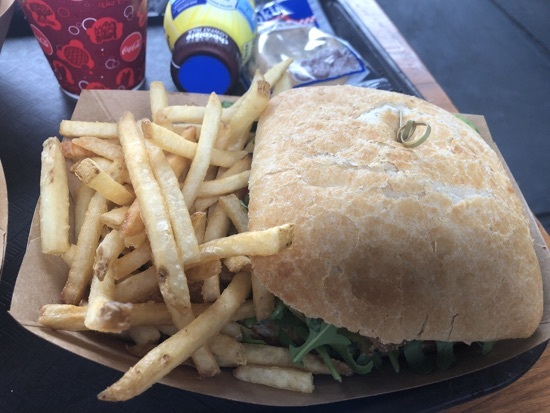 After meeting the mice we called it a day on our time in animal kingdom for this trip and drove over to magic kingdom, we arrived around 5pm and I was feeling hungry, I fancied a sandwich but struggled to find one. In the end I grabbed an orange for Dd from Starbucks on Main Street which she ate before her and DH&rsquo;s Fastpass for big thunder mountain. 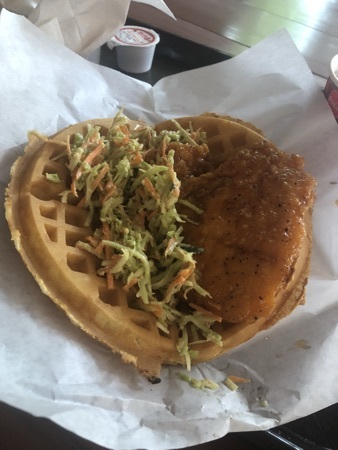 While they were on the ride I called into sleepy hollow for a sweet and spicy chicken waffle. This was served with coleslaw and a side of potato chips. It cost $10.99 and to be honest I wasn&rsquo;t too impressed, it was too spicy and I like spicy food. The sauce soaked into the waffle making it really spicy too and meant it wasn&rsquo;t a break from the intense spice. The coleslaw was also pretty dry and not great. The potato chips were fine. I ate what I could and then went and met DH and Dd as they came of big thunder mountain. 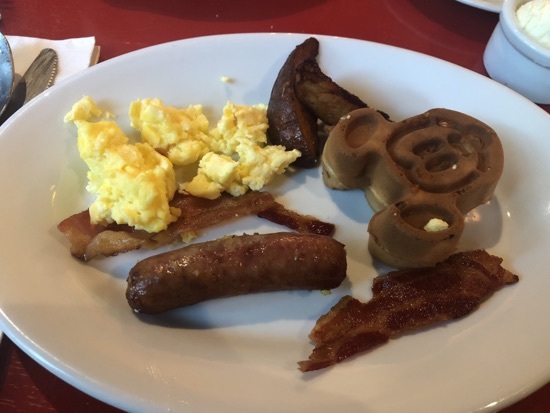 While eating my waffle I had got DH and Dd a fastpass for splash mountain so we arranged a place to meet when they were done and they went off to ride. 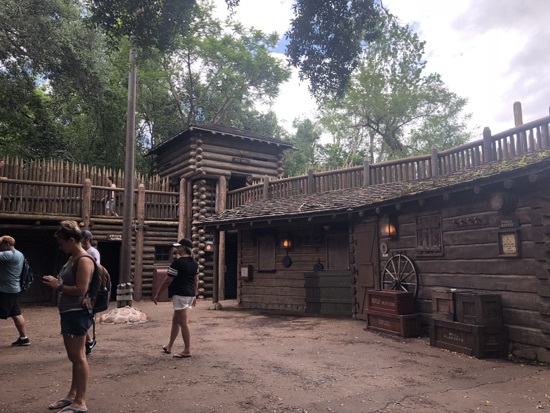 I sat and people watched in Frontierland and it began to rain, it wasn&rsquo;t heavy but it looked threatening. 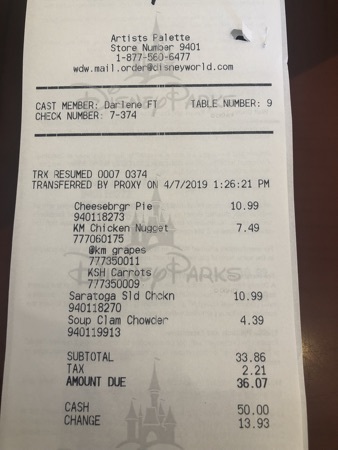 When Dd and DH got off splash we decided to go and get them two some dinner and escape the rain, we crossed the park to cosmic rays and ordered some food. 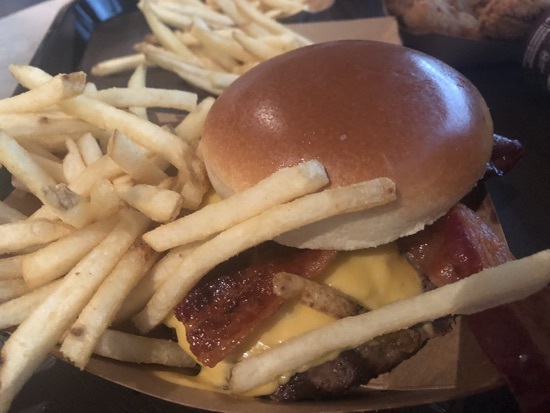 DH had the 1/3 bacon cheese burger, Disney burgers are always good, you can&rsquo;t go wrong with these and the toppings bar is great for adding pickles and things. 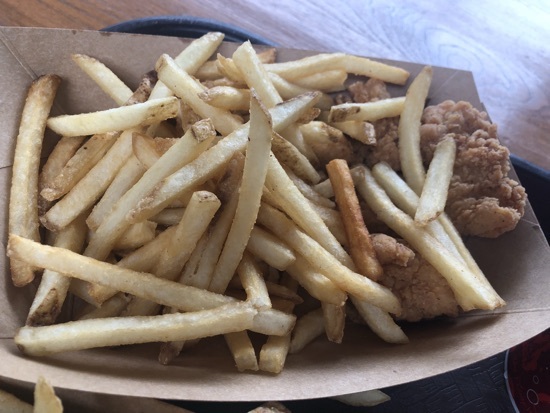 Dd got kids chicken nuggets and had 2 lots of fries as her sides, the other options weren&rsquo;t appealing at all, it also meant I could have a few fries to snack on. 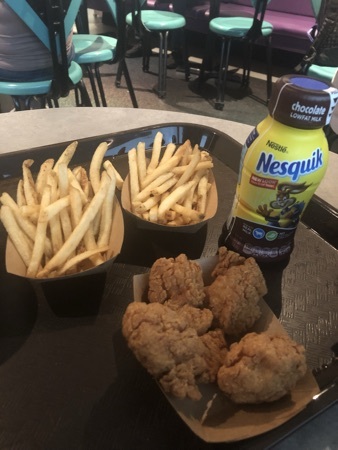 DD&rsquo;s meal also came with a chocolate milk. I got a frozen strawberry lemonade slush. This was really good! Very refreshing and a lovely flavour. Total cost came to $28.52. The rain had all but stopped by the time we finished so we walked over to the barnstormer and Dd and DH rode this using the fastpass I got while they were on splash and booked another one for the mad hatter tea cups while they were on the barnstormer. We all rode the tea cups together before wandering through Tomorrowland and having a ride on the people mover. 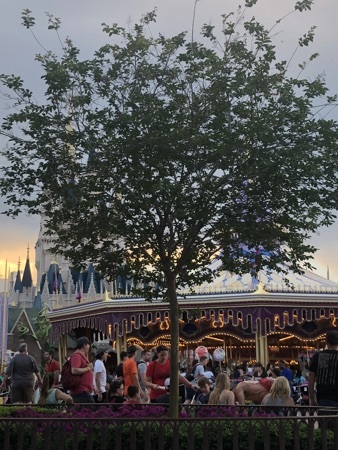 It was now only half an hour until happily ever after and after missing it the other evening due to it being delayed because of the weather we didn&rsquo;t want to miss it again so we made our way down to Main Street and found a nice position to watch it. Our view was the best we&rsquo;ve had yet, the crowds had thinned out due to the weather earlier which was nice. After the fireworks we made a quick exit from the park and used our usual strategy of catching the resort monorail to the transportation and ticket centre. We were back at Old Key west just after 10pm and off to sleep not long later. This morning we&rsquo;d set an alarm for 9am as we had to pack to move resorts. I actually managed to wake at 7.30am. 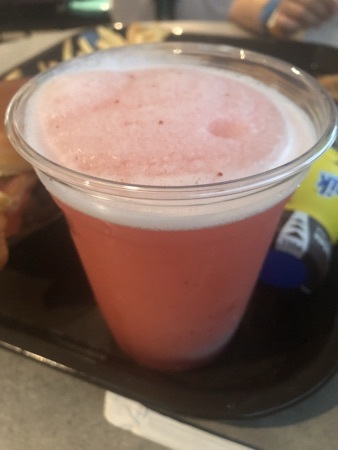 DH went and got coffees in our mugs at roaring forks and Dd had her candy apple we bought in magic kingdom the other night for her breakfast. I finished off what she couldn&rsquo;t manage. We packed up our stuff, organising our cases so we don&rsquo;t need to unpack everything at Old Key west, we gave bell services a ring at 10am and they came up and collected our cases and bags of food. 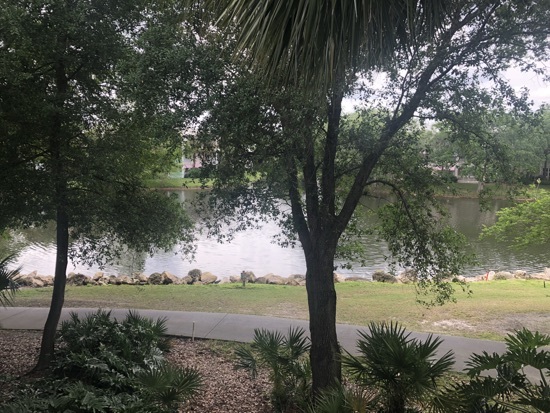 We spent a few more moments making the most of our balcony view and then made our way down to the wilderness lodge bus stops. We were heading over to fort wilderness for Dd to do a pony ride. The bus came and stopped first of all at the outpost at fort wilderness and then made stops at each of the internal stops before reaching the trails end/pioneer hall bus stop. 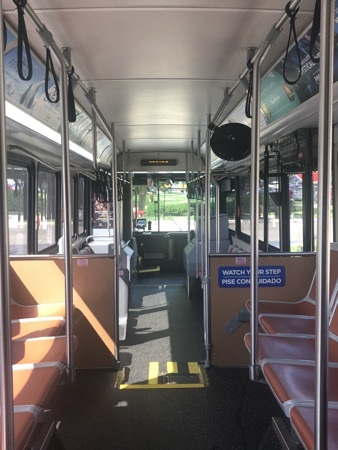 We were the only ones on the bus until we reached fort wilderness. We got off and wandered over to the pony ride stables. This is $8 for 1 lap or $12 for 2 laps. 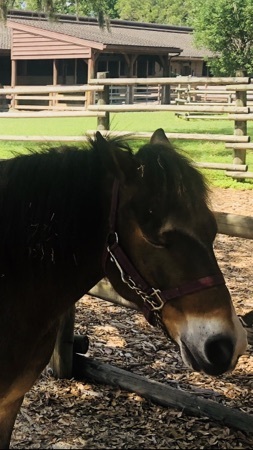 The pony DD was given was Hershey, the same pony she rode in 2017. It took about 10 minutes but was really nice and Dd absolutely loved it. 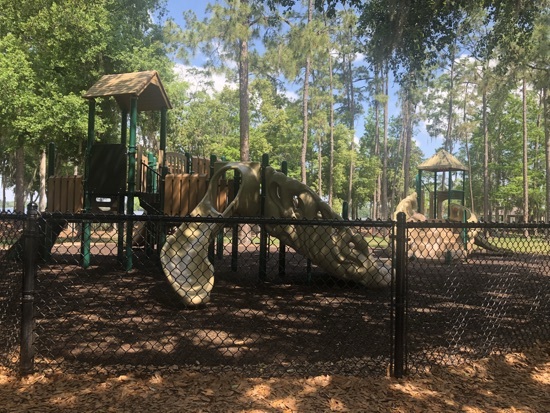 We walked over to the playground area and Dd spent some time playing on here, the playground is in the shade so didn&rsquo;t get too hot in the sun which is really good as a lot of the playgrounds on property are far too hot to play on by late morning. 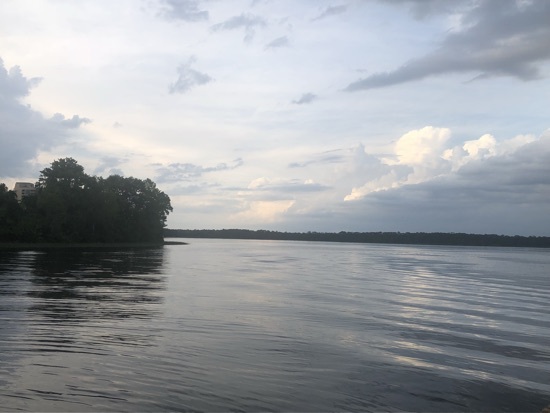 After a bit of a play we walked down to the boat launch and waited for he boat back to wilderness lodge. 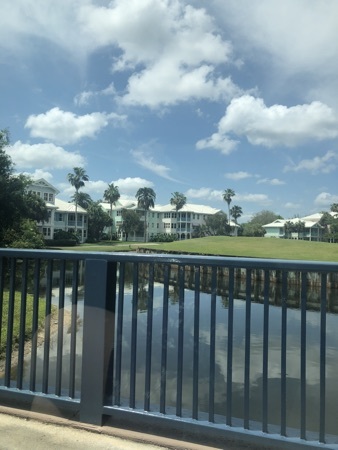 We only had a 5 minute wait and were quickly back at the resort and able to collect our car. 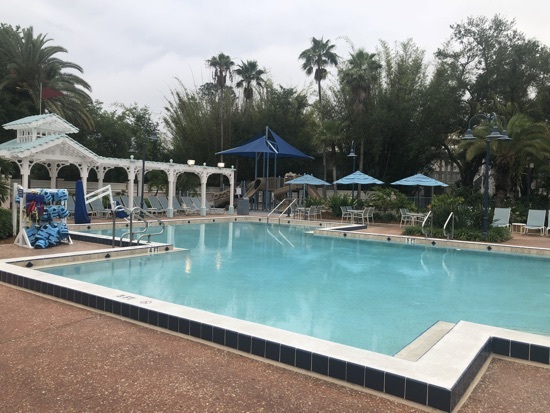 We&rsquo;d received the notification to say our room was ready at Old Key west at 10.50am so we decided to head over to their and check out our new room for he rest of our trip. 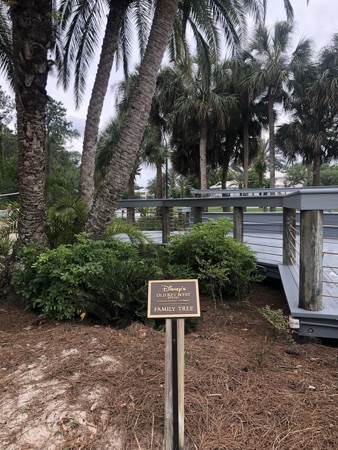 We are in building 49 at the end of south point road. 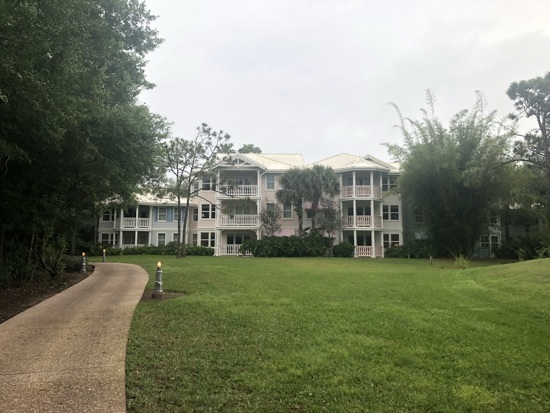 It&rsquo;s a long trek from hospitality house but there is a trail from our block right to the pool at the end of turtle pond road and it&rsquo;s only a few minutes walk so that&rsquo;s really handy and we actually really like the location as we would probably always drive to the main part of the resort anyway. After having a look round the room we were feeling hungry so we drove over to goods to go but as far as we could tell all the seating was outside and it was just too hot to deal with that. We jumped back in the car and drove over to Saratoga springs and got some lunch at artists palette. 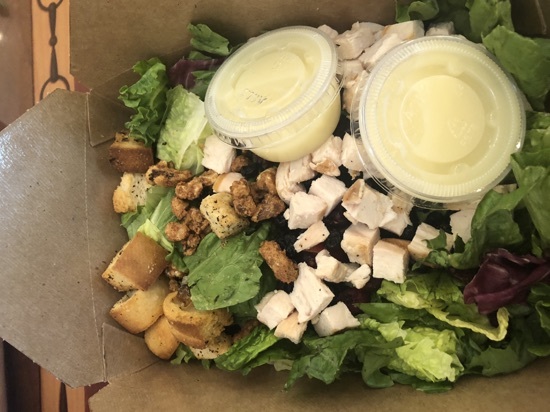 DH had a Saratoga salad $10.99 and a side of clam chowder $4.39. 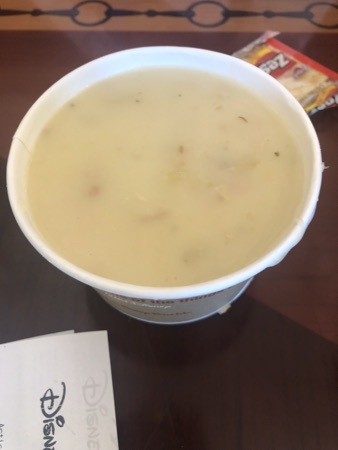 He really enjoyed this, only criticism was the clam chowder wasn&rsquo;t peppery enough for his taste but this was soon rectified using a few sachets of pepper. 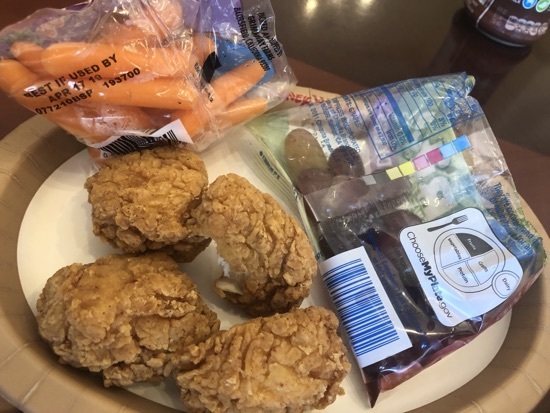 Dd had a kids chicken nugget meal, this was 4 chicken nuggets, a bag of carrots, a bag of grapes and she had a chocolate milk, this was $7.49 and i thought it was very poor for the price in comparison with other kids meals. The nuggets were tiny and there was no option for any other sides like fries to bulk it out. I had the cheese burger pie $10.99. 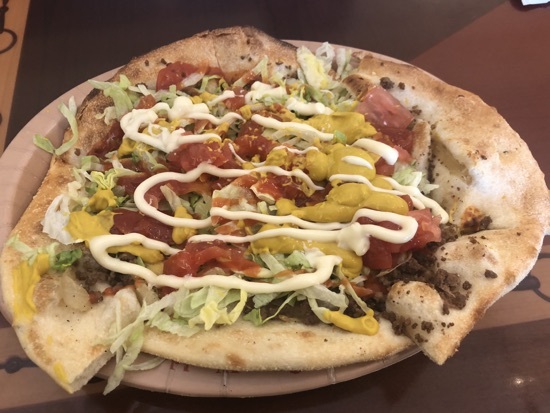 This was a thin crust pizza with cheeseburger toppings, beef, cheese, tomato, pickles, mustard, mayo and lettuce. This was really good and I thoroughly enjoyed it. Total for lunch came to $36.07 and other than DD&rsquo;s disappointing meal the rest was great. After we&rsquo;d eaten we drove back to Old Key west and checked with bell services if I luggage had arrived at the resort and it had, they said they would follow us right over with it, so we drove round to our room and waited for the cases and bags to be dropped off. After we&rsquo;d unpacked the bits we would need for the rest of our time here we decided to spend an hour or so at the quiet pool on turtle pond road. The pool wasn&rsquo;t too busy and we were pleased to see a quick service counter to buy food and a refill station for the mugs. After an hour in the pool we returned to our room to get changed and discuss our evening plans. 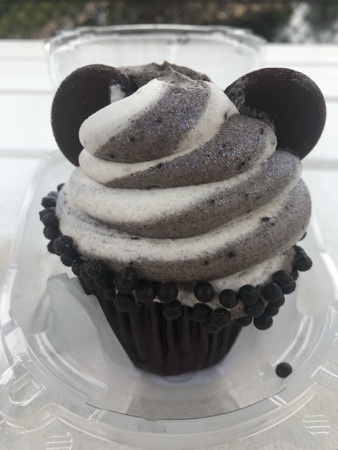 We struggled to decide what/where we fancied for dinner this evening so ended up driving to Hollywood studios with the plan we would get something while we were there. We got there about 5.30pm and had a look in Starbucks, they had loads of cakes but nothing savoury to have for dinner first. We made our way down Hollywood Boulevard and stopped off at Rosie&rsquo;s all American cafe where DH got the 1/3 Angus cheeseburger. 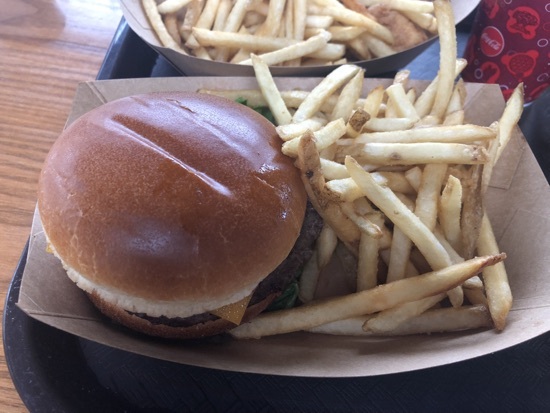 This was a standard Disney burger but he enjoyed it. I had a fried green tomato sandwich. I was fancying a sandwich and this was the closest thing I could find. It was fine, nothing special, probably wouldn&rsquo;t get it again. The choice here was pretty rubbish too. 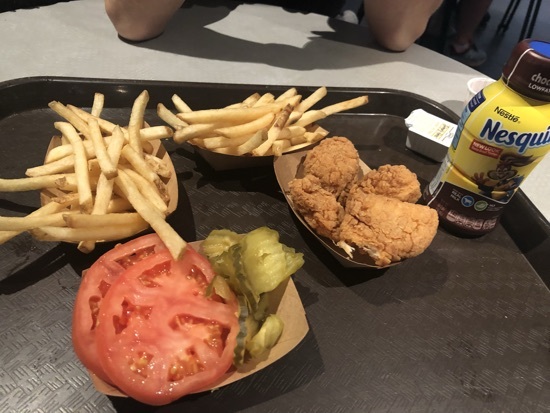 Dd got a chicken nugget meal and this time was great value for money! She had loads of nuggets and fries and it came with a cookie and a chocolate milk. Our total for dinner was $30.01. We had a fastpass for star tours so DH and Dd made their way over to use this. 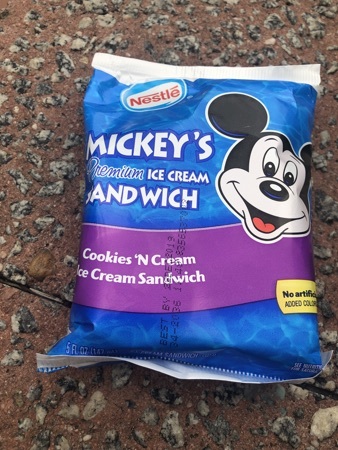 I sat on a wall close by and got myself a Mickey ice cream cookie sandwich, I absolutely love these, it seemed to melt really quickly though. A lot quicker than normal?! When DH and Dd returned we went off to meet Olaf this was a lot of fun and we had planned to continue the character meets with Minnie and Mickey but the queue was upto 35 minutes by then so we gave it a miss. We walked over to the animation courtyard where Dd spent some time playing and posing for photos in the empty character meet areas. 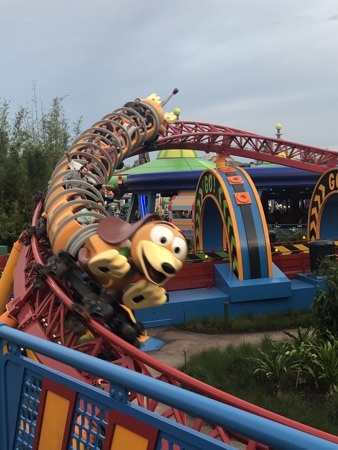 DH wanted another look in the Star Wars launch bay and after a look round and ruling out meeting BB8 due to the length of wait we walked over to toy story land for our fastpass for slinky dog. Dd absolutely loves this ride! It was now time to make our way over to fantasmic. We had a fastpass for this so had a specific area to sit in. It has been 5 years since we last did this and I now remember why. It&rsquo;s not great other than the last 5 minutes. I imagine it will be another 5 years before we watch it again. Getting out at the end is also abit of a faff. 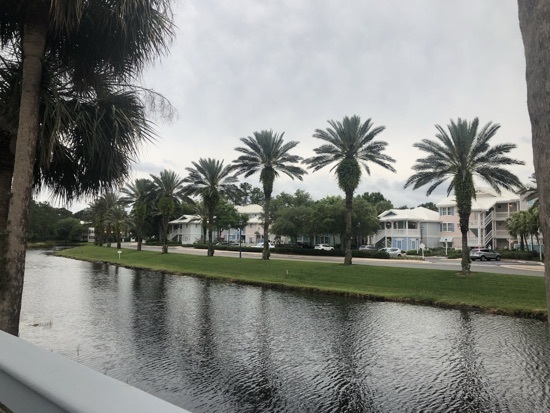 We slowly exited Hollywood studios and drove back to Old Key west, we had a chill in the room and out on the balcony before calling it a night. This morning we were all awake around 8.30am. 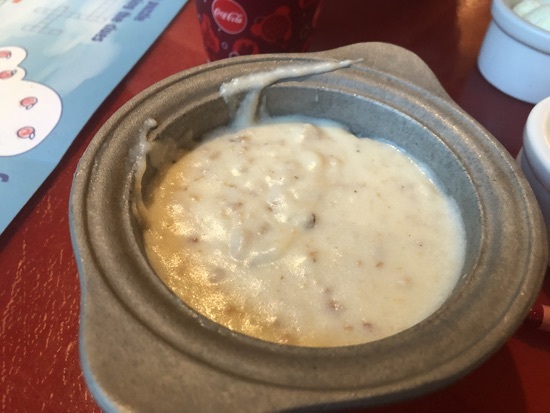 We decided as it was our last full day at wilderness lodge we would try for breakfast at whispering canyon cafe. 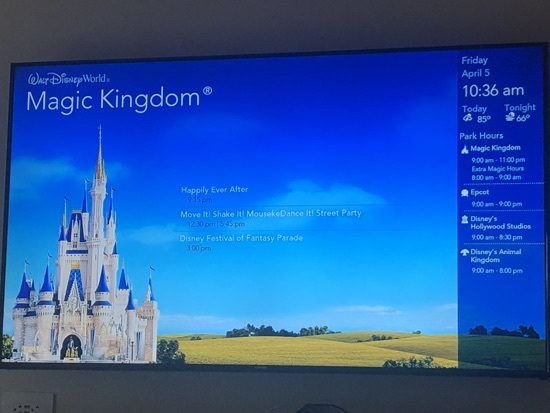 I looked on my disney experience and managed to get a 9.15am reservation. We got ourselves sorted and headed down there. We checked in and were seated pretty quickly. There were plenty of antics going on around us, servers embarrassing their tables and ketchup being carted around from table to table on request. 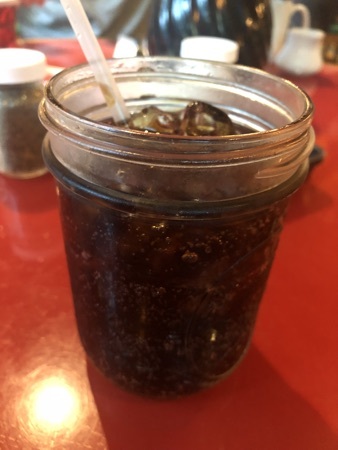 Our server took our drinks order first, I had a coke, Dd an apple juice and DH had coffee. We knew what we wanted to eat from checking the menu before coming down from our room. 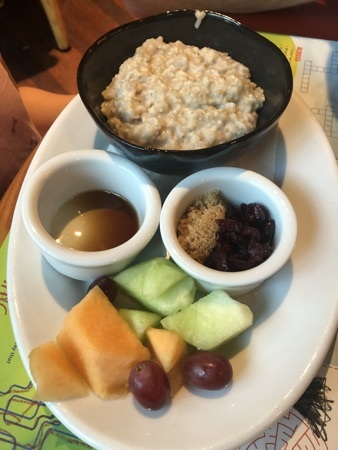 DH and I were both having the skillet and Dd wanted the oatmeal with a side of fruit. We waited and waited and eventually the biscuit and gravy were brought out and a pot of maple syrup. We then waited and waited some more before the rest arrived. It took ages! When the skillet arrived the contents were cold, we were that hungry and our server was literally nowhere to be seen we just got on and ate it. 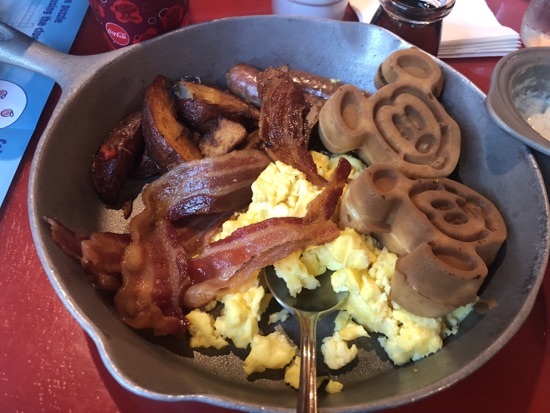 The skillet had bacon, sausage, scrambled egg, Mickey waffles and breakfast potatoes. The food was ok, but cold. Dd had oatmeal which she topped with sugar, syrup and dried cranberries and really enjoyed. Our server came over and asked if everything was ok and I told him that no to be honest it was pretty cold, he apologised and about 5 minutes later we had a fresh skillet and everything was piping hot. It was just a shame the first one hadn&rsquo;t been like this. We managed to finish most of this one between us too so least we finished on a high. 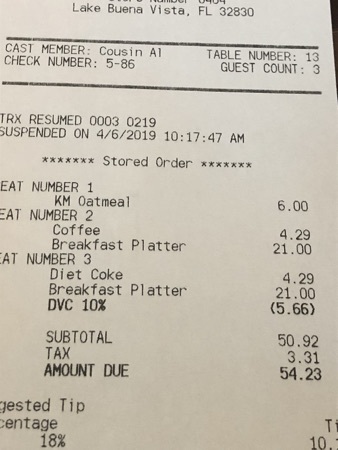 Whispering canyon does 10% dvc discount so totally was $54.23 pretty expensive for breakfast but it bad for on property. 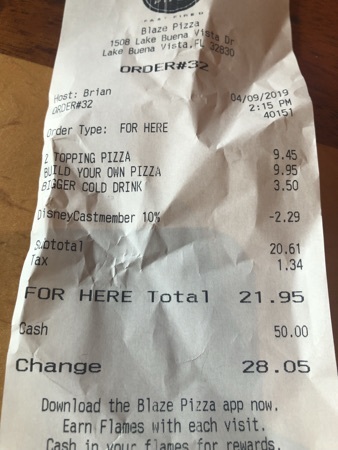 After we paid up we grabbed our stuff for the day and headed out to Epcot, before leaving I managed to grab us a fastpass for 11.25am for frozen ever after. 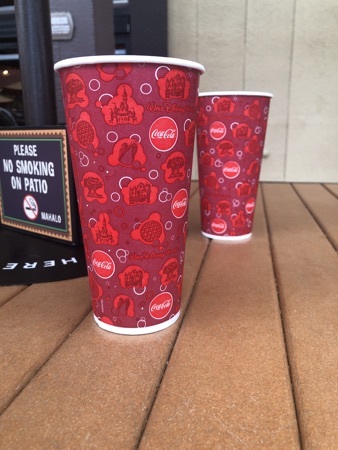 We arrived at Epcot and made our way to Norway via club cool where we sampled the different coke products. We were well within our fastpass return time when we arrived and once scanned in I made us w further fastpasses for two of the tier 2 rides. 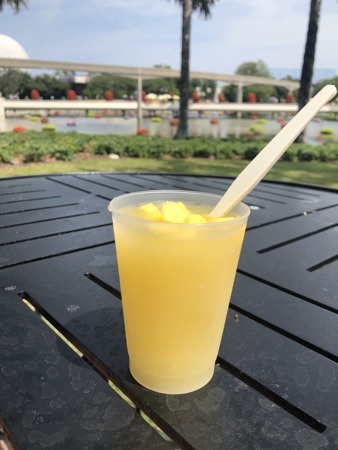 After frozen DH wanted to watch reflections of China so he took Dd to watch that while I walked back to the start of the wild showcase and got a tropical slush topped with mango pieces from one of the flower and garden food booths. This was $4.75 and really refreshing! The weather today was a lot hotter than it had been upto now. 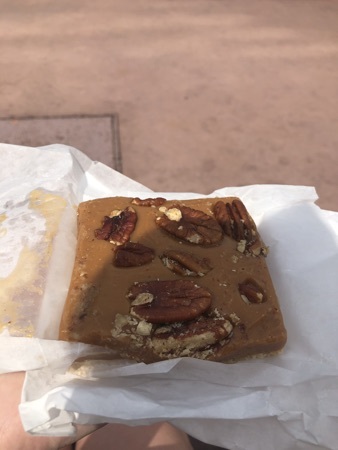 e carried on round the world showcase and when we got to Germany we called into karamel kuche for a pecan caramel bar, this was $4.75 but they do 20% passholder discount. I saved this for abit later as I was still stuffed from breakfast. 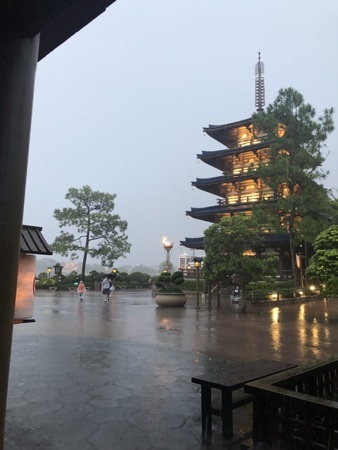 We continued on to japan where we had a look in the mitsukoshi shop and then round to the start of the world showcase plaza. My feet were starting to hurt abit but now so we stopped off at the kids play park just after Canada. Dd had 20 minutes or so in here and really enjoyed it. While having a sit in the shade I managed to get Dd and DH a fastpass for test track, as our other 2 fastpasses had expired I was now able to book another tier 1. 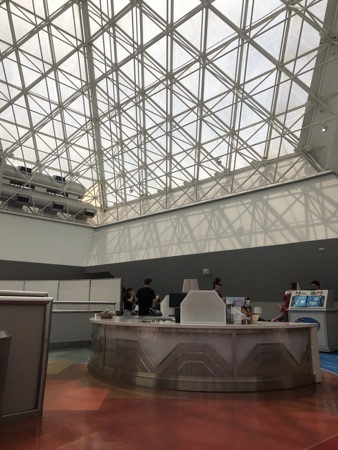 They went off to ride test track and I took this opportunity to visit the dvc lounge, it was pretty busy in here this afternoon, lots of people with the same idea to escape the heat for a while. DH messaged me when they had ridden test track and I met them outside of the figment ride, as I was waiting for them I made a start on my pecan caramel bar and Dd helped me out when she arrived. Plenty of spaces when we arrived just after 4pm. We walked up to the top end by splitsville and Dd called into the Star Wars shop and bought herself a lightsaber. She&rsquo;s wanted one for a while and DH is thrilled she&rsquo;s showing an interest in Star Wars. After this was purchased we walked over past the Edison and onto the Joffrey shop where we bought a couple of bags of their coffee, it&rsquo;s not badly priced especially when you take off the 20% passholder discount. 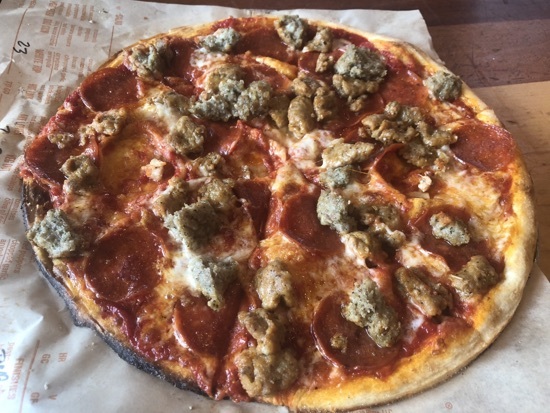 We were feeling hungry by now so I suggested blaze pizza. 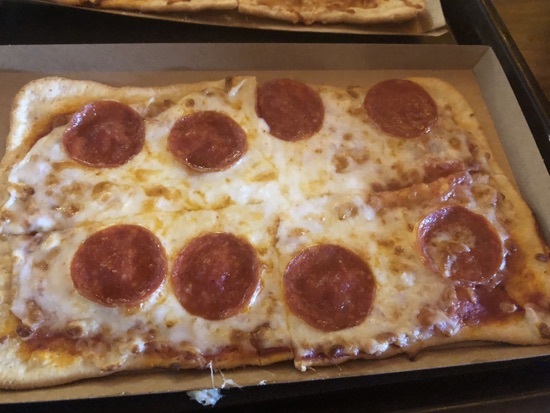 This reminds me of a subway style pizza shop. 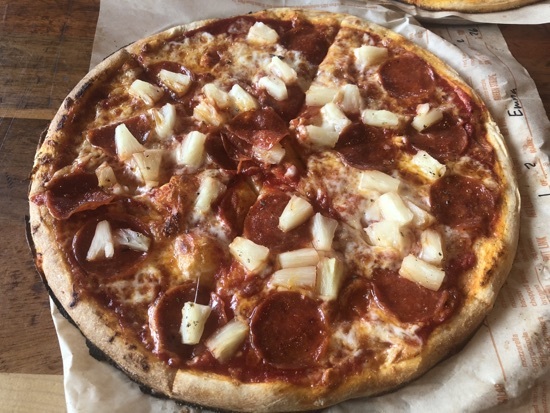 We ordered 2 pizzas between us, first up was a red sauce, mozzarella, pepperoni and pineapple. 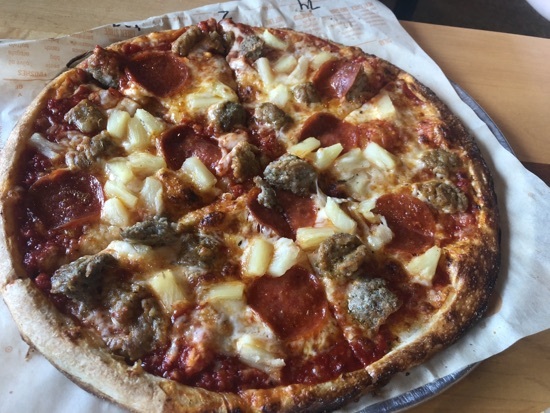 The other was a red sauce, mozzarella, pepperoni, salami and spicy sausage. These pizzas are cooked in 180 seconds and were absolutely amazing! 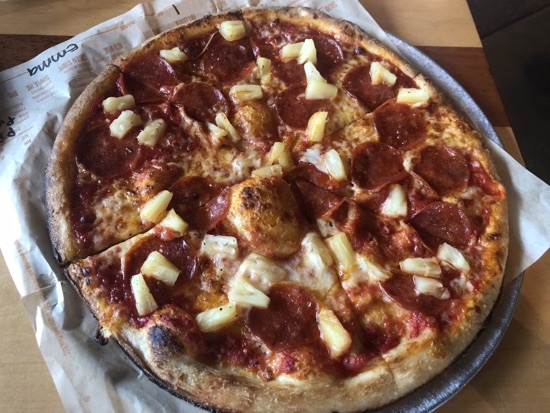 Some of the best pizza I have ever tasted. They were $9.95 each which we thought was incredible value. 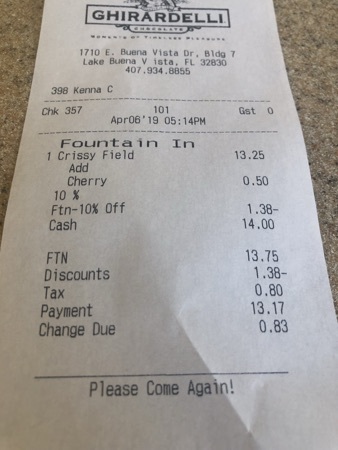 We also got a fountain drink to share and the total came to Just under $25. 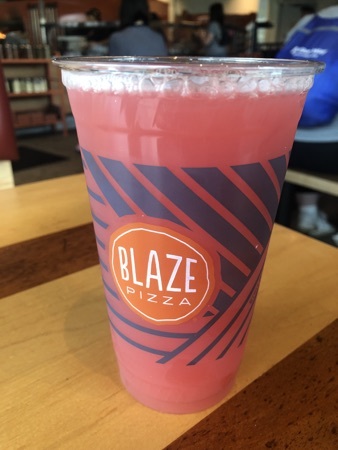 We were all really impressed with blaze and it&rsquo;s somewhere we would definitely come back to. 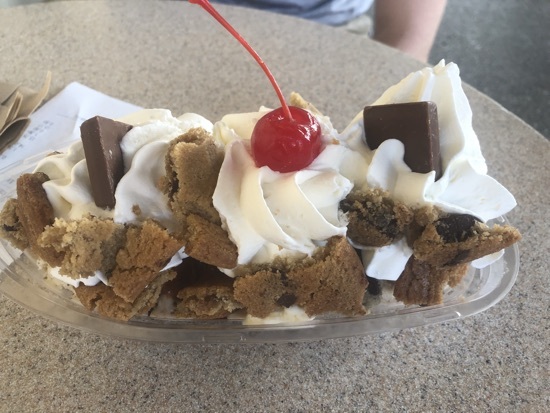 We walked round towards marketplace end of Disney springs and settled on getting a sundae to share from Ghirardelli, we chose the crissy fields sundae, this was cookie and cream and vanilla ice cream, fudge sauce, whipped cream, chocolate chip cookie pieces and 2 chocolate caramel Ghirardelli squares. 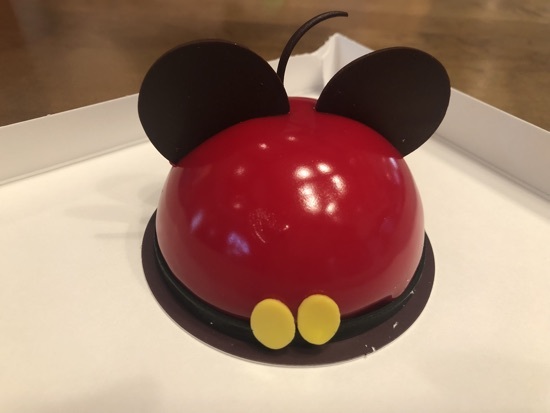 We also paid an extra 50 cents for a Cherry on the top for Dd! 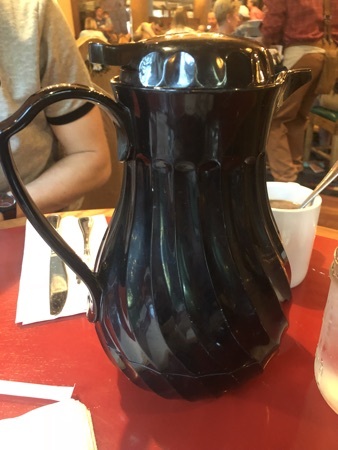 This came to $13.17 after discount and it was more than enough between 3 of us, we only just managed to finish it off. 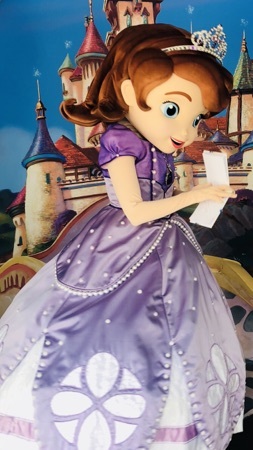 Next is was a fastpass for the princess meet and greet, but we had about a 20 minute wait so we queued for the carousel as this is one of DDs favourites. Then it was along to meet elena and Cinderella. When we came out it was raining abit and there was lightening in the area, we decided the philharmagic would be a good choice as it was right next door and would keep us out of the rain. Before heading into the theatre I picked us up a fastpass for dumbo in 15 minutes time, it was currently closed for inclement weather, however if you hold a fastpass for a closed ride it changes to a multiple experience fastpass that can be used for any ride in the park (except seven draws and meeting Mickey and Minnie). 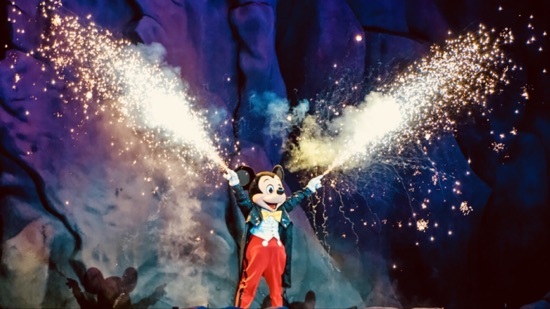 We love  philharmagic and I can&rsquo;t help but sing along to it. 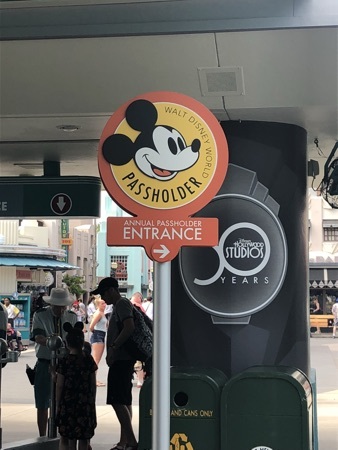 When we came out of the theatre our fastpass had indeed been changed to a multiple experience one and I booked us another, my plan was to get 3-4 of these so we could just choose what rides to fastpass after the fireworks. We wandered down to Main Street to watch them however the announcement came that they were delayed due to the weather which we weren&rsquo;t exactly surprised about. We decided rather than stand endlessly waiting for them we would sack them off for tonight and use our fastpasses for some rides. First up we walked over to haunted mansion, I love this ride at night it gives it such a good atmosphere. 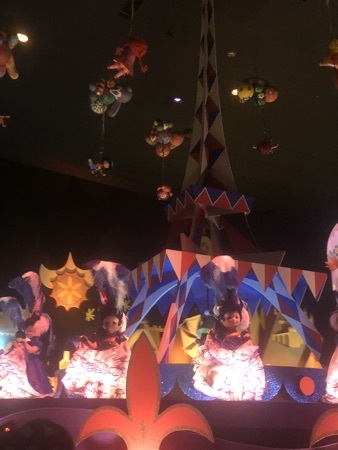 When we got off this we walked round to it&rsquo;s a small world, another classic that we all enjoyed. After we got off here we made our way down Main Street and out of the park, we could see a boat at the dock for wilderness lodge and weren&rsquo;t hopeful of making it, however the captain saw us coming and waited and opened the gates/ropes for us to climb on board which we were really thankful for as it was now spitting quite heavy. The boat was really quiet considering it was park closing and we were back at wilderness lodge in no time, we were straight to bed absolutely shattered. I woke up around 3.20am but was able to get back to sleep and woke up properly at 10am! It was great to have a proper lie in and upon looking out realised it was pouring down so it was probably a good morning to miss due to the weather. 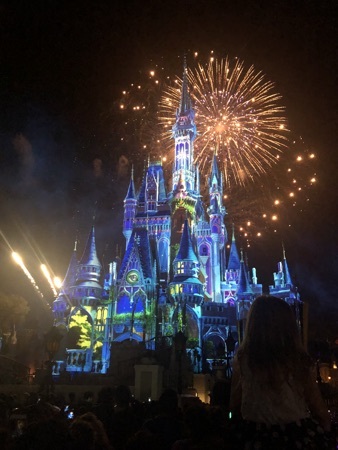 We got ready and decided to drive to magic kingdom and park in the car park (odd I know), Dd wanted to get the monorail and were not sure what getting back to wilderness lodge will be like after the fireworks. We arrived at magic kingdom at 12.30pm and it was time for our seven dwarfs fast pass, DH and Dd rode this and I managed to pick up at fastpass for Peter Pan for just after 1pm. We were feeling hungry so as we were near to Pinocchios village haus we decided flatbreads were a good option for lunch. We got a pepperoni for $11.99. 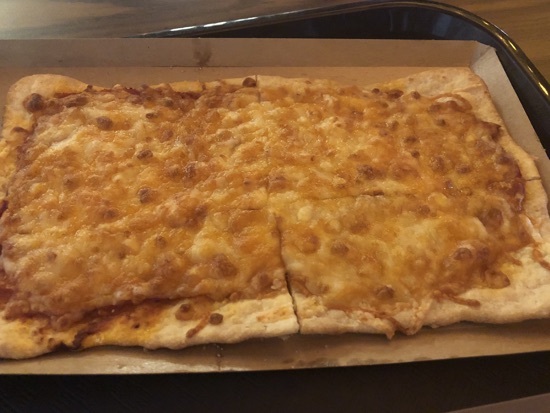 We also got a gourmet cheese flatbread. Also $11.99. We shared the 2 of them between us and it was just about enough. 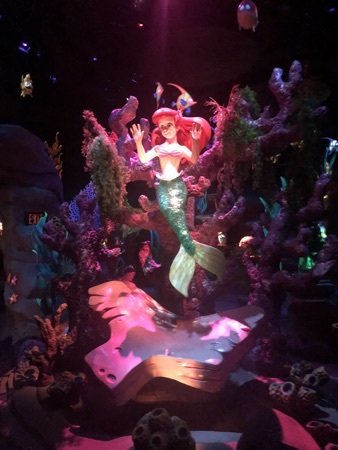 It was then onto another fastpass for journey of the little mermaid, it&rsquo;s such a lovely little ride. As we came off this I picked us up a fastpass for pirates of the Caribbean but this wasn&rsquo;t until 3.10pm. 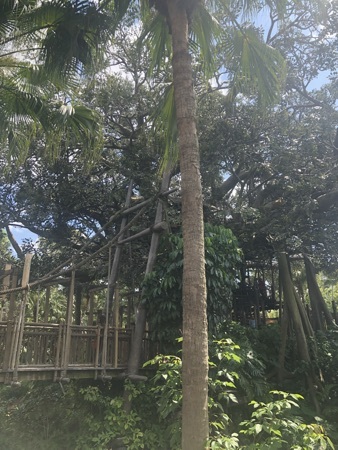 Dd had been wanting to go in the Swiss family Robinson treehouse so she did his twice and then we found a spot in Frontierland to watch the festival of fantasy parade. Magic kingdom seemed less crowded today and we were able to get a good position with a decent view of the parade. After this is was time for pirates which was especially nice to cool off in the air con. We came oh and used a fastpass I&rsquo;d picked up for the Aladdin flying carpets. 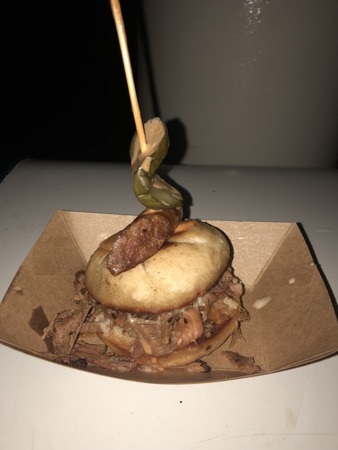 When checking my disney experience I found a fastpass for big thunder mountain at 6.30pm, this was still a couple of hours off and we were feeling hungry again so we decided that we would catch the monorail over to the Polynesian for some dinner. We considered the tambu lounge but in the end went for he counter service captain cooks. 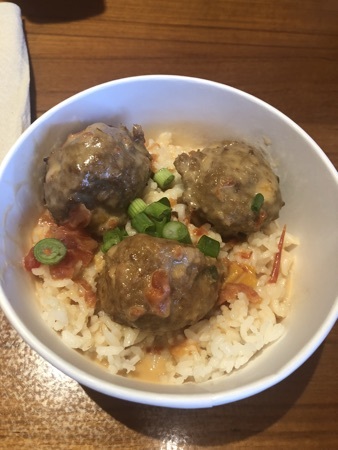 DH had the thai coconut meatballs this came with sticky rice and he really enjoy it. 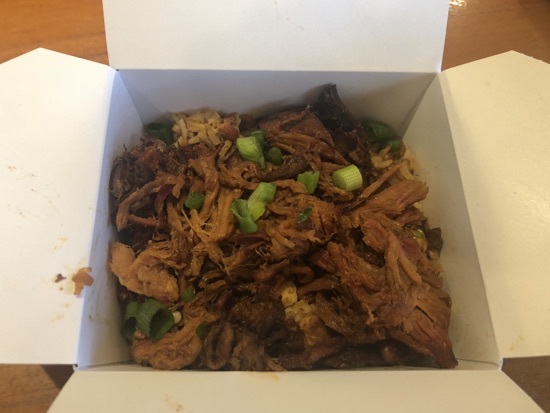 I had the pork fried rice, this was fried rice with pulled pork on top, it was really tasty and there was loads of pork and in fact the whole thing was a huge portion. DH and I also got 2 iced waters with our food and added some squash to it. 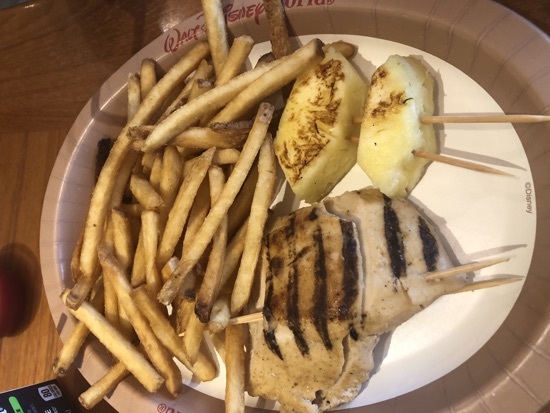 Dd had the chicken and pineapple kids skewer. We subbed the side for fries and she also got an apple juice with this. Total came to $28.09 which was great value! We got he monorail back over to magic kingdom and on the way in a lovely family stopped us asking if we wanted their fastpass for seven dwarfs mine train. 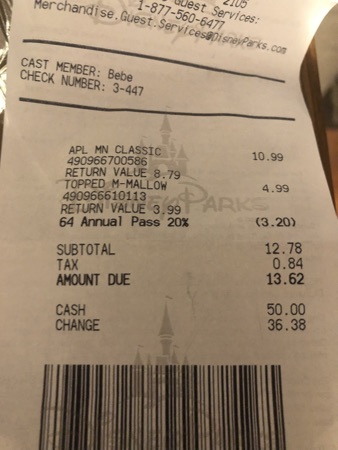 They quickly spoke to someone at guest services and we were issues with an anytime multiple experience fastpass which we were ever so thankful for the kind gesture! We walked round to big thunder mountain having a look in a few shops and DH and Dd rode using our fastpass I got earlier. 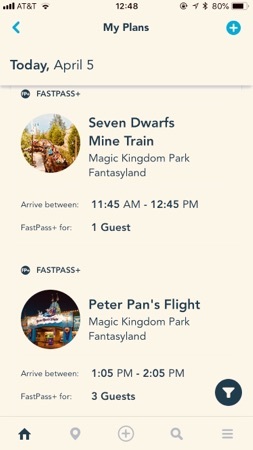 We used our next fastpass to meet Tiana and rapunzel and then DH and Dd went on seven dwarfs mine train using our gifted fastpass. When they got off the ride Dd was close to tears and really struggling with her ear so we decided to head back to wilderness lodge so we could give her something for it. 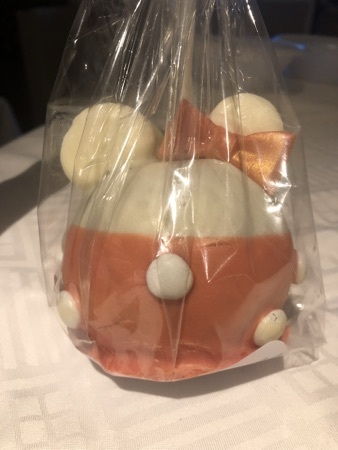 On the way back to the front of he park we asked Dd if she would like a treat to take back, she chose a Minnie Mouse decorated candy apple. 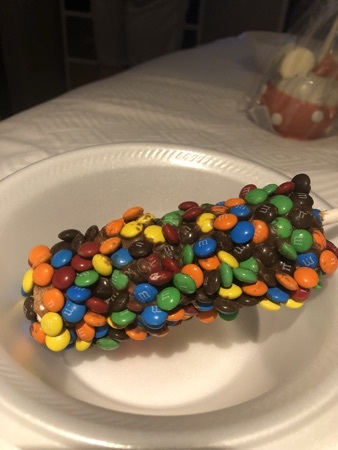 I got myself a m and m covered marshmallow wand. This was really good and Dd helped me finish it off! 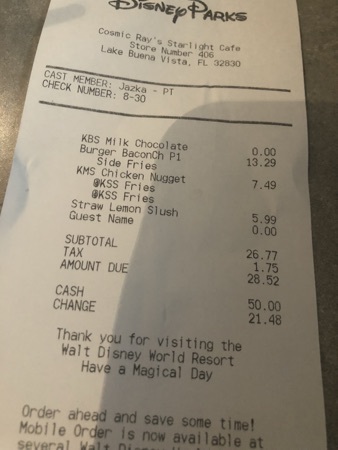 Mains street confectionary does annual pass discount so we got 20% of the cost and it came to $13.62 for them both. Dd and I got the boat back to wilderness lodge as there was on waiting as we left magic kingdom, that left DH to return to the parking lot to retrieve the car. It took DH 20 minutes longer than us to get the car and drive back so we may reconsider the boat sometime. We got back quickly and sorted out Dd with something for her ear which kicked in quickly thankfully and we shared my m&m marshmallow wand and we watched some of the fireworks from our balcony.